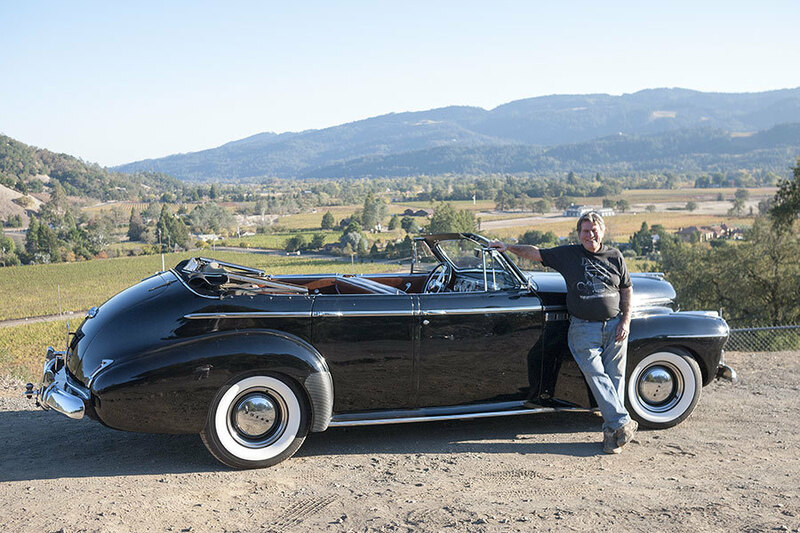 Russ Aves with his 1941 Buick Roadmaster convertible, overlooking Calistoga off Route 29. On Bennett Lane in Calistoga. Russ in his St. Helena workshop. Russ' latest project, a vintage motorbike gifted from a neighbor who bought it new and found it stashed in his garage. The first car Russ bought was this 1932 Ford three-window coupe. One of the buildings that Russ built for Yverdon, the family winery. The drag strip of Bennett Lane. I was with friends Bruce and Robin in their backyard garden, shooting a portrait with their old yellow pickup, when Russ Aves' name came up in the conversation. HE was a man I had to meet, they said and insisted that we go right then and there. Bruce went rooting around for a motorcycle helmet that would fit me, found one that would do, and off we went on his blue Harley Davidson Sportser. Get Truly Napa Valley, and discover the heart and soul of this famous wine region. In a residential area of St. Helena, we pulled up to an old redwood barn flanked by a couple of acres of old-vine zinfandel. Joe, a friend of Russ' was outside prepping automobile body panels for painting. The yard had the look of a well-established and well-equipped garage and service center. The barn door was open and in its path a sorry-looking old motorbike dangled by a chain from a forklift. A quick peak in the barn revealed a cavernous collection of things acquired over a lifetime. Russ came out with a welcome hello and smiled when Bruce asked about the wire wrapped around the crumbling tire of the old dangling bike. "Better to keep it original then to rip it off and put a new one on," he said. Introductions were made and he showed me around. This comfortable old barn is his personal workshop. It houses engines and vintage car parts, antique furniture piled high, old machines, tools, file cabinets and curled old family photos tacked to the walls. In between engine parts I noticed a tray of drying prunes next to the labels he personally designed and printed for his latest bottling of wine, a 2012 old-vine zinfandel he's calling Coupe de Grace. But the stars of the show were his 1941 Buick Roadmaster convertible and his 1932 Ford three-window coupe. I marveled at the beauty of these classic cars and jokingly asked if we could go for a ride sometime. Later that week, he rolled that old Buick out of the barn, took the top down, and we went for a ride that I wish could have lasted forever. Russ was born in 1936 and grew up in West L.A., playing football with the neighborhood kids that included Robert Redford, he's been told. When he was 15, he bought his first car — that 1932 Ford three-window coupe in his workshop — for $75. It was a time when the hot rod culture of California was in full swing, and teenage Russ was all over it. He and his little deuce coupe were later featured in the March 1960 issue of Hot Rod magazine and he's been involved with hot rods and classic cars his entire life. He got the 1941 Buick in 1958 while working part-time at a cadillac dealership in San Luis Obispo, where he was studying mechanical engineering at CalPoly. He likes to tell the story. "A bunch of Oakies were driving this car up Questa Grade - a long steep hill there - they were driving it hard when they heard an awful noise and looked back to see a rod laying in the road with half a piston still on it." He laughs. They managed to roll it to the Cadillac dealership and offered to give it to him in exchange for a ride home. They got their ride, Russ got the car and soon after he found a 1952 Buick in the local junkyard with the engine he needed. He's been driving it ever since and even became a founding member of the Buick Club of America. The car has had a life of it's own. Very few of them were made in 1941, when the war stopped production of them as passenger vehicles. This is likely to be the Buick that carried President Roosevelt in a 1942 parade through San Luis Obispo. Rumor has it that now there are only 10 still around. When Russ got it, it became his daily driver, and he's quick to point out that "Nobody was conceived in it, however. Not in my possession." He's taken it on road trips across the country, piling as many as five people into its remarkably cushy seats. In 2000, Russ loaned it to Touchstone Pictures to be featured in the 2001 movie Pearl Harbor. He brings my attention to the passenger windshield, which is slightly darker than the driver's side. The movie studio shot out that side and had it replaced but never told him. When he was 15, he bought his first car, a 1932 Ford three-window coupe for $75. Russ came to Napa Valley in the late '60s with his young family from Los Angeles. He wasn't keen on raising his kids in L.A and his dad had set his sights on starting a winery in Napa Valley. Accustomed to working alongside his father (who invented and manufactured automobile accessories), Russ built the family winery Yverdon on Spring Mountain with his own hands. The name Yverdon comes from a town in Switzerland where Russ' grandmother grew up. She learned how to make wine there and passed the knowledge and interest on to his father. Their vineyards were on Bennett Lane, where Russ remembers drag-races on the only stretch available in Napa Valley. There's a great big beautiful olive tree on the side of the road there, which has been known to contribute to Russ' annual olive harvest. You can park under that tree - an idea that was popular with young lovers of his day. Russ describes his dad as a difficult person to get a long with and it was in the late '90s when wine production stopped. Eventually the winery was sold and it's now known as Terra Valentine. Now retired, Russ spends his time tinkering, inventing, fixing and polishing in his vineyard workshop. His projects usually involve a classic machine or some kind of homemade culinary goodness. When asked if he’s got a favorite wine in the valley, he replies “Yeah, my zinfandel.” No doubt, it is some of the best in the valley. Out of his two and a half acres of 30-year-old zinfandel vines, Russ makes a barrel of wine each year. His most recent bottling is a 2012 vintage that he bottled earlier than expected because it was “just right.” He gave me a bottle to take home. I’m still trying to figure out how to get a whole case out of him. 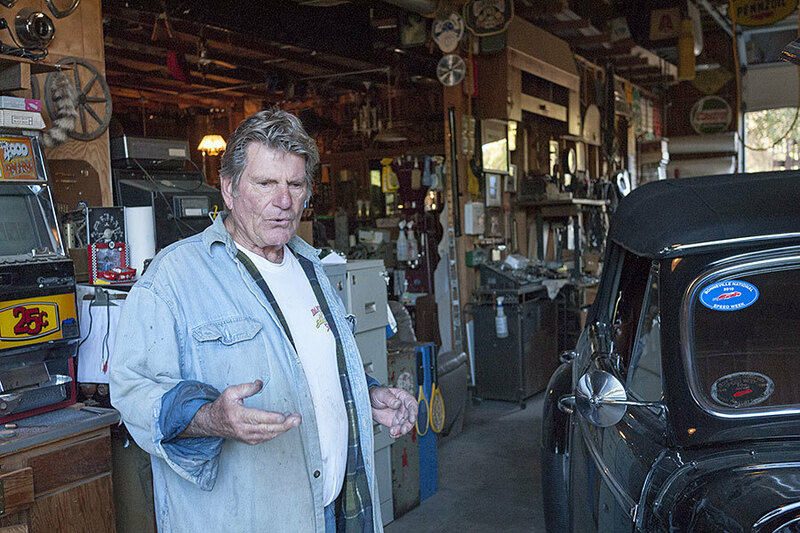 His current daily driver is a 1940 black Ford pickup that he's owned for over 25 years. He says it has several modest modifications, one being the installation of some 1939 Ford passenger body moldings. But the Buick still gets its share of love. For the past 15 years or so, he's been taking it on an annual road trip to the Bonneville race flats where it serves as a push car. Russ is a remarkable man. As a prominent figure in the world of hot-rodding and classic cars, he doesn't hesitate to share his expertise with an enthusiastic audience. He'll use his dusty old Singer to sew his own leather upholstery, then turn around and make a batch of brownies for a community gathering. His hands have helped build some of the finest vineyards and wineries in Napa Valley, and have probably worked on most of the vintage cars here as well. Now it's winter here, but that shouldn't stop us from taking our next joyride. That 1932 Ford coupe is calling.